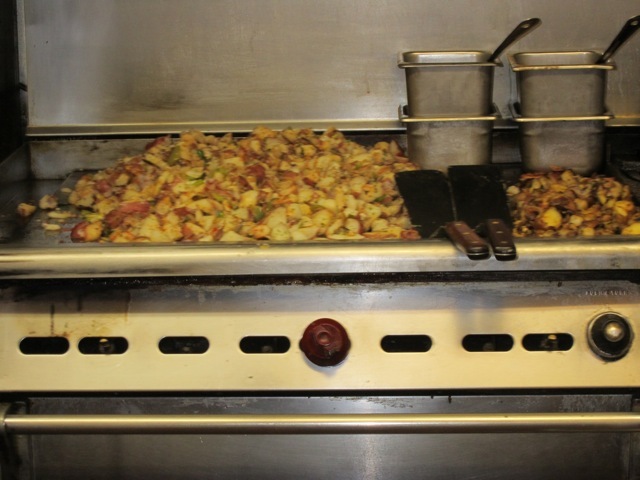 It all started with the home fries. I have been stalking Cafe Med’s home fries, which are more like mush than fries, and they often taste like a dirty wash cloth. Just the other day, Julia, a hard working, loyal veteran employee, who doubles as one of a rotating crew of cooks, was asked to refund a patron’s money over the home-fries. “You’re right,” she told the customer, “the fries are crap.” She rarely talks like this. What’s it to me? I want the Med to thrive forever, a monument to an old Berkeley, which is dying out. I’ve noticed that a lot of customers barely touch their mushy “fries.” There’s no fry there. Last year Medfries were at least edible. Photo by Ted Friedman. If Becker would check, he’d see that most people throw away their potatoes. “I only have their best interests in mind,” I shot back. I seem to think I’m some executive owner, just because I’ve promoted the Med in my articles. 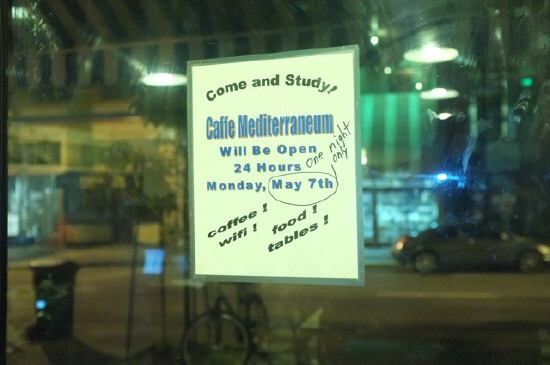 However, when Becker bought the Med four years ago, I puffed the notorious cafe to a student editor in the Daily Californian’s offices. Her piece caused a discernible uptake in student business, without which the Med cannot survive. “Don’t drag me into your sordid stories,” commanded BR’s dapper executive, Michael M.
'Don't blame me; I didn't make those fries.' Med kitchen recently. Photo by Ted Friedman. But he won’t do anything about low morale among two of the Med’s most senior employees, who have a combined 55 years of service. I have recurring nightmares in which I am 86’d from the Med and Moe’s books across the street, despite the fact that I was on good terms with both owners. I may have escaped an 86 this time, but the threat is out there, and the nightmares will persist. Blink your eyes and you can see the Med’s future look. Some of the new look has already happened with table placement. Tables have been moved farther away from the counter to accommodate the mobs, forced to mull about like corpses from “Night of the Living Dead,” as service slows to stop action speed. Every cramping move jams us together, like bugs stuck in jam. The Med was once open and spacious, almost palatial with its vast downstairs. Now it’s cramped, and students with computers hog tables. Chairs are breaking down, and table space can be scarce. As BR reported in its last piece, the Med will soon have beer and wine, and later hours. If the alcohol sales boost profits, Becker would like to turn a precarious ledge above the entrance into an extended balcony, another cozy touch that shrinks us. Here at BR, we say first things first. The omelets, are popular. But fix the fries. 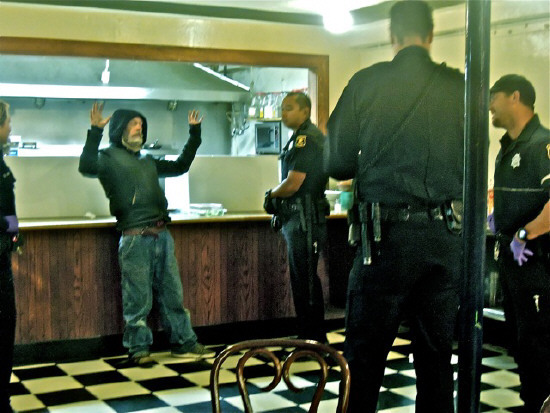 As Ted Friedman at the Berkeley Daily Planet, a stumble-bungling Clark Kent reporter, I have written more than a score of articles about Berkeley’s Cafe Mediterraneum and its denizens, whom insiders call Medheads. My first Med piece, ‘Why the Med Matters’ was published (in print!) four years ago. The occasion was the Med’s 50th anniversary party, which brought back people we had not seen in years, like Wes Fader, a legendary monologist who commanded our attention for hours. He allowed no feedback. Twenty years ago, I thought I had paid my dues at the Med — it was now my turn to talk, and I somehow managed to interrupt the blow-hard mid-sentence. He looked at me as men look at turds. At the re-union, I reminded him of the incident. “Oh, I remember you,” he said twenty years later. “You’re the interrupter.” He would remember that, because I was the only Medhead who dared interrupt. 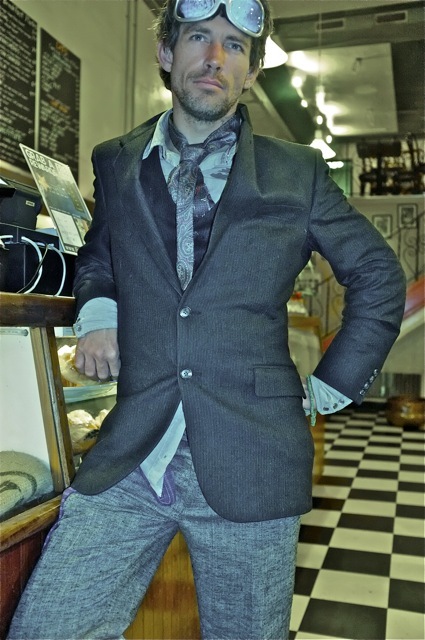 Fader, who had recovered from a stroke recently looked in fine fettle in a seersucker suite. reporter piece on the all-nighter, a Berkeley first. Photo by Ted Friedman. Wednesday, some Medheads discussed what it meant to be a Medhead. To one discussant it didn’t mean much; “I just pop in an out when I have nothing to do,” he said with disdain. He didn’t know it, but that was so Med. I would never flip-off the Med as did this non-identifying slug. In fact, the Med, for me, falls just short of a religion and psychotherapy. But what would I do if the Med rejected me, and what does that even mean? Steed says: if you want to save airfare to Berkeley for a taste of those Med taters, just soak a dirty dish rag in dirty water, and bite it! This entry was posted on Monday, May 21st, 2012 at 12:36 pm	and is filed under Med Heads & Cafe Culture. You can follow any responses to this entry through the RSS 2.0 feed. You can leave a response, or trackback from your own site.